You flaunted your Muslim piety at every turn, (while ignoring the parts where Progressivism is in conflict) – And demanded respect for same. And now, you mock Vice President Pence’s faith. 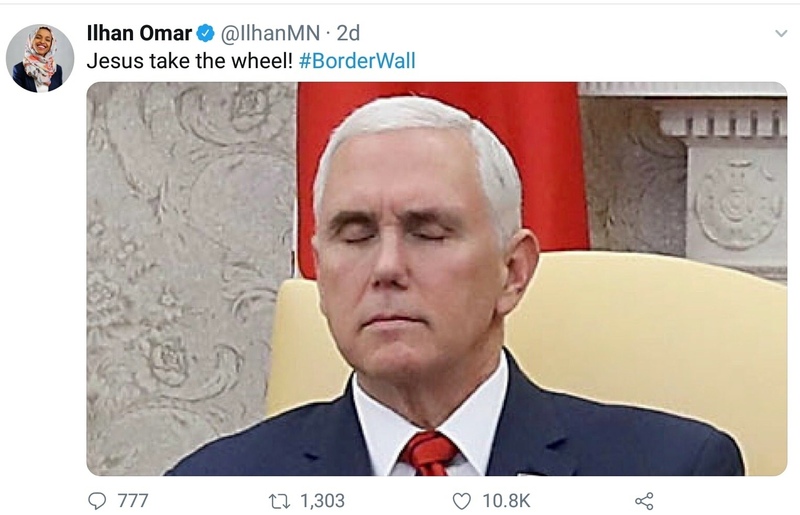 This entry was posted in Democrat Party, MN Congressional and tagged Ilhan Omar by Mitch Berg. Bookmark the permalink. But… but… but… she’s Muslim and he’s a CHRISTIAN. It will be interesting to track her record on constituent services for the next 2 years. I’ll bet she runs a Clinton style pay to play operation – constituent service will depend first based on identity, second based on campaign contributions (and employment of “her” people) and then if there’s time for everyone else. Too bad the MN GOP isn’t going to try to mount a campaign against her in the next couple decades. She’s visibly corrupt, a credible black or Hispanic candidate could successfully run against her with backing. Her parents and grand parents were govt officials/employees back in Somalia before graft and corruption led to a civil war that made Somalia the garden spot and tourist destination it is today. She’s just gone into the family business (graft and corruption). The best way to attack Ilhan Omar is for conservatives to recruit among her base. Granted the free housing, free-handout constituency is hard to persuade but there are a substantial number of Somali business people and social conservatives. Let’s not repeat past mistakes. He’s stuck in a meeting where Trump is arguing that America needs a border fence to keep out the migrant hordes while Pelosi and Schumer are insisting the nation must be kept defenseless, all of it on-camera. There is literally nothing he could say or do that would help. Best thing is to keep his mouth shut. I couldn’t do it, I’d have leapt up and started slapping people upside the head screaming “What the hell is wrong with you??? ?” Mike Pence is a man of steel, I tell you. As for the Muslim looking down on the Christian because of his religion, that’s nothing new, it’s been going on for 1,000 years. Look up the word “dhimmitude” and ponder how eagerly the Left in this country would embrace it. There’s a lot going on in that tweet. As for the tone of mock / smarm for Christian religiosity, that’s substantially white liberal atheist snark dialect talking. And I’m surprised actually she’s culturally fluent that way, that she actually picked up on that. I just don’t see the elasticity of mind there for an ESL person coming out of the Muslim world to get that ‘humor’ (such that one can call it ‘humor’). That’s not a tweet you could make if you thought you could ever run for anything besides the mn-5 cd seat. How long before some Muslim twaat performs the first ululation on the Senate floor?